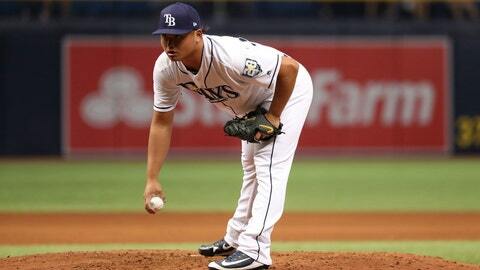 Chih-Wei Hu made just five relief appearances with the Rays in 2018. He spent most of the season at Triple-A Durham, where he went 5-7 with a 4.66 ERA in 24 games, including 19 starts. CLEVELAND (AP) — The Cleveland Indians have acquired right-hander Chih-Wei Hu (chee-way-hoo) in a trade with the Tampa Bay Rays for infielder Gionti Turner. The trade was announced Monday. The 25-year-old Hu made just five relief appearances with the Rays in 2018. He spent most of the season at Triple-A Durham, where he went 5-7 with a 4.66 ERA in 24 games, including 19 starts. With Tampa Bay, Hu struck out 12 in 13 innings. He was acquired by the Rays in 2015 from Minnesota in the non-waiver deadline deal for right-hander Kevin Jepsen. Hu had the lowest ERA (2.59) in the Southern League in 2016. The 18-year-old Turner hit .296 (50 for 169) in the rookie-level Arizona League last season. He was a 27th-round draft pick this year.